Sherry and I used to take our dogs to be groomed by a woman named Nancy Green. 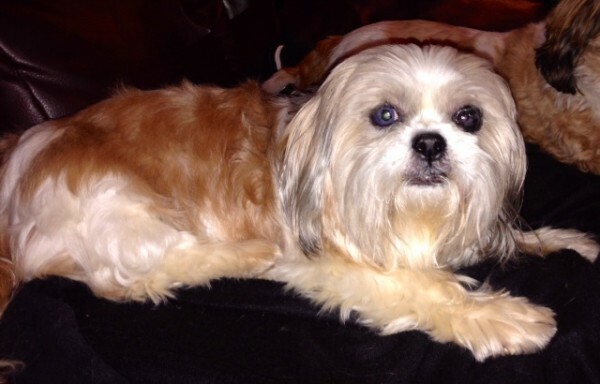 She was highly skilled and turned our dogs into dolls—which was OK, because they are shih-tzus, and Sherry fusses over her little divas. Nancy had a shih-tzu named Abby who stayed in a cage right near the grooming table when Nancy was working. Nancy had adopted Abby from a truck driver who decided life on the road wasn't good for a dog. Abby had a real throaty, gravelly bark. Sherry called her "Gravel Gertie." She was a cute little dog, and we grew to know the Greens well enough so that when Nancy and her husband, Kenneth, would travel out of town for ballroom dancing competitions, Abby would stay with us. In fact, she stayed with us one whole winter while Nancy and Kenneth visited their son in Florida. A few years ago, Kenneth had a stroke. And it seemed that no sooner had he recovered than Nancy had a stroke, one much more severe than Kenneth's had been. They needed to find a new home for Abby. Of course, we took her. Abby was 13 when we adopted her. She was blind and deaf, but by barking insistently, she got what she wanted because her barks had a limited number of meanings: I want to eat, I'm thirsty, I want to go out, I want someone to come sit with me, I want to go to bed. We would figure it out by process of elimination. This summer, she would lie on her belly in the grass, head up, bright faced, looking like she owned the world. Over the past couple of weeks, Abby's health ebbed and flowed. She'd be fine for a few days, then she wouldn't eat, no matter what we made for her. This week, she ate on Monday, but that was it. I attributed it to a change we had made in our dogs' food. The Greens have another son who lives in town. He owns a restaurant on the city's main street called Green Acres. On Tuesday, the top of the building was struck by lightning. It was an ill omen. We euthanized Abby last night. The vet said her heart was failing, which meant her kidneys were failing, which was stressing other organs—an unstoppable domino effect. When we drove her to the vet, I knew she wouldn't be coming home. That doesn't mean I cried any less.